Surface enhancement through turning (also known as peeling) can provide benefits in many areas. High-speed centerless turning machines remove scale, cracks, seams, deformations, decarborized layers, and other imperfections resulting from hot or cold rolling, continuous casting, and other processes used for producing bar or tube. BPC provides a wide range of capabilities utilizing high-speed, efficient turning centers providing dimensional control comparable to cold drawn material. 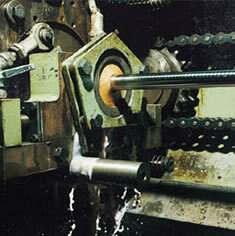 through turning of steel bar.